I've been drooling over B-Bistro's menu for a while now, so when Dan surprised me with reservations one evening, I was so excited!!!!!!! B-Bistro is a lovely place for a romantic dinner: it's small, cozy and intimate and has such a great atmosphere! 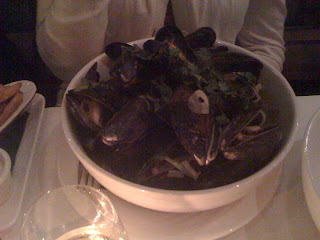 To complement the mussels, I chose a glass of the Cava Avinyo ($7.50 for 5 oz) a light sparkling wine. 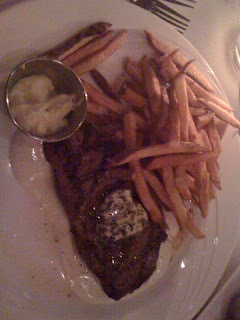 Dan chose the Steak and Frites ($25) which was a Roseda Farms strip served with garlic butter. There was A LOT of butter - beware. The steak itself was very good though, but perhaps it was swimming in a little too much butter. Also, for some reason, Dan and I forgot both our meals came with fries and we ordered a side of their Duck Fat Roasted Fingerling Potatoes ($5) which were served with rosemary and some more garlic aioli! They were great - and perfect for sharing. Profiteroles and Creme Brulee for dessert! We barely had room in our tummies for dessert but I really wanted to try their homemade desserts (they also make their own pasta, though neither of us tried that). 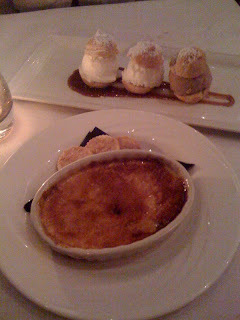 We decided to order the creme brulee and the profiteroles. The profiteroles came with 3 different scoops of homemade ice cream (of your choice!) and served with a salted caramel sauce. I chose Cardamom, Nutella and Vanilla ice cream and all 3 flavors were AWESOMEEEEEEEEEEE. I love cardamom and I looooooooooooooove Nutella (which we all know). The pastry of the profiteroles were OK - in all honesty I think I would next time I would order the ice creams separately since neither the pastry nor the sauce added anything extra. Overall, I love this place and would come back in a heartbeat. I hate to compare it to another restaurant - but it almost reminds me of a smaller Woodberry Kitchen. Or at least, it has a similar type of menu. It's much more intimate though, which I LOVED. Also, our server was super friendly and helpful - I wish I remembered his name!!! What a gem of a restaurant! p.s. I am running a giveaway for a $25 gift certificate to McCormick & Schmick's so enter it today - it ends at 11:59PM on Sunday March 21st! I LOVE this place! i only went once, for restaurant week, and it was grand. b-Bistro, Tio Pepe, and (oddly enough) The Watertable are the most haute, most pleasurable, most memorable Restaurant Week meals I've had -- and I've been to a lot of them. Thanks for reminding me I want to go back! I dislike it when the steak has that much butter, unless the picture makes it look worse than it was. Then again, I eat my steak, medium-rare with just a tad of salt and pepper. Starla - You loved the Watertable because you were in good company hahahaha Just kidding - that meal WAS fabulous. Remember the delicious sorbets????? Jay - It was A LOT of butter. Dan said that was his biggest complaint about the meal, though the steak itself was delicious - it definitely didn't need that much. one of my favorite restaurants in Baltimore - hands down. We went there for our engagement dinner! I haven't tried the mussels, but now I want too. Is it bad I want to live in Bolton Hill, so I can walk there? Lauren - Not bad at all! I would go there ALL THE TIME if I lived there, even for just a cup of coffee, it's so lovely!